Reptiles started their separation from aquatic environments millions of years ago, eventually evolving such strong adaptations that they grew to enormous sizes as dinosaurs. 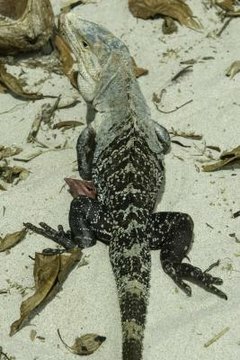 Most modern reptiles, although smaller than dinosaurs, continue to use the same adaptations to live completely on land, without the need to return to the water. Aquatic reptiles, such as sea turtles, still return to land for key milestones in their lives, such as laying eggs. Reptiles don't regulate body temperature like mammals, who are warm-blooded. Reptiles are ectothermic, often called cold-blooded. Instead of relying on internal body temperature like mammals or surrounding water temperature like many amphibians, reptiles use behavior and their environments to keep their body temperatures at optimum capacity. When they feel cold or sluggish, they bask in the sun to warm their bodies. When it gets too hot for reptiles to function effectively, they move into the shade or hide in underground burrows to avoid the heat. Laying eggs that can survive on land is a major adaptation allowing reptiles to live away from aquatic environments. Amphibians tend to lay soft, gelatinous eggs, and most use forms of external fertilization. Such eggs wouldn't survive the dry conditions found on land. Instead, reptiles lay eggs covered in a thick, leathery coating or hard calcium shells after using internal fertilization to create viable eggs. Some reptiles deliver live babies, carrying the eggs inside their bodies until the babies are ready to be born. Reptiles developed thick, scaly skin that helps conserve moisture inside their bodies, an essential feature that helps them survive not only on land, but in dry, desert areas as well. The skin is waterproof -- not so much to keep water out, but rather to keep it in. Reptiles also tend to have efficient excretory systems, removing as much moisture as possible before releasing waste. This typically leads to firm feces and highly concentrated urine. Living on land means reptiles can't rely on absorbing oxygen through their skin like amphibians. All reptiles have lungs they use for breathing -- even those who live most of their lives near or in water, such as crocodiles, must surface to breathe. Lungs allow reptiles to venture far away from aquatic environments. Most reptiles have two lungs, similar to mammals, but some snakes only have one. What Kind of Reptile Eggs are Hard? What Are Some Unique Traits About Reptiles? How Do Snakes Maintain Homeostasis? What Happens to a Reptile's Body Temperature When the Outdoor Temperature Increases? Why Do Amphibians Have Thin & Moist Skin? What Is the Life Cycle of Reptiles From Eggs to Adults? How Does a Praying Mantis Breathe? Why Can Seals Only Get Oxygen From the Air? Are Geckos Reptiles or Amphibians?